Technical Guide 1 | MARUTAI DOBOKU Co,. 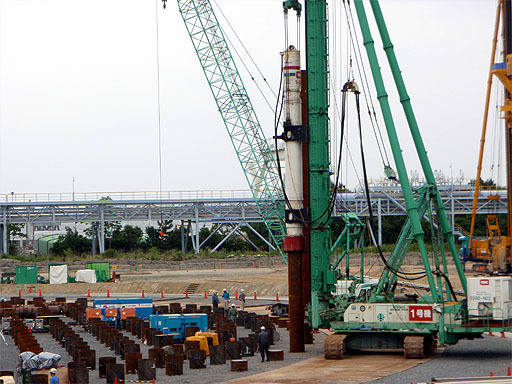 Ltd.
A method, by transferring the vibration of the Vibro-hammer to the pile via a steel pile chuck to lessen the soil particle bonding around the pile to reduce the surface friction and point resistance of the pile, in order to drive the pile into the ground with the self-weight of vibro-hammer and the pile itself. When no environmental measure is needed, an electric vibro-hammer is used. For less vibration and noise, an electric variable momentum type or hydro variable super-high frequency type is used. 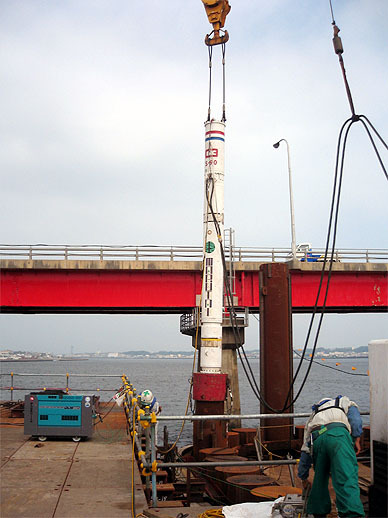 In cases of punching through a hardened intermediary layer, into a bedrock/ gravel layer with boulder, or a long and large diameter pile, where vibro-hammer alone is not capable to apply, a water-jet or auger is used as auxiliary method, enabling to correspond with various sorts of ground or situation. 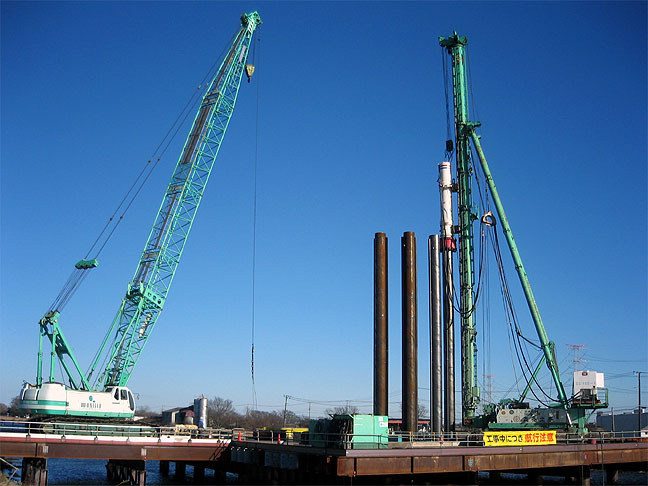 A method in which a steel pile or steel wall pile is installed with vibro-hammer, and when the pile reaches a set depth, hydraulic hammer strikes the pile head to drive the pile point into the bearing layer for optimal bearing power. 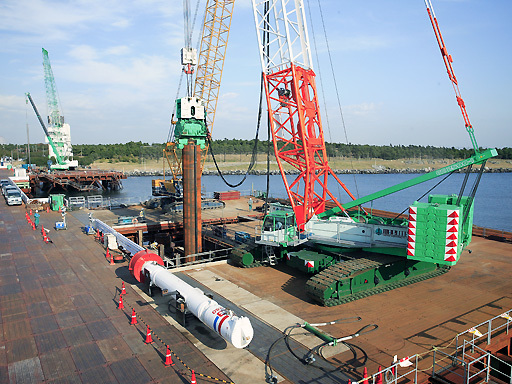 In this method the level of bearing value is easily confirmed with the pile drive, and also possible to reduce the number of gears with the use of crawler crane to pull up the hydraulic hammer. 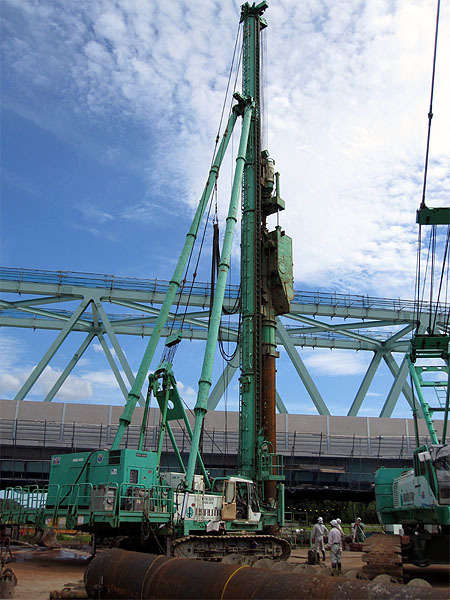 A driving method of steel and steel wall piles at minimum pollution using a hydraulic hammer equipped three-point pile driver. In recent years, the system was replaced by a single acting type with free falling ram. 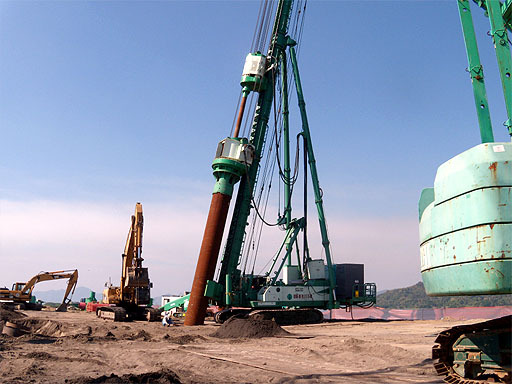 By adopting "Double Action Method" that is when a ram hammer falls, it is hydraulically pushed up, and thus the number of strike is increased for improved work speed. 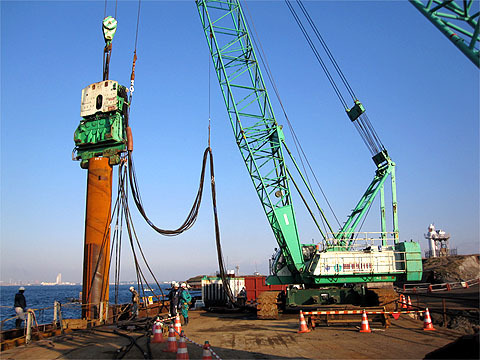 The bearing value may also be calculated by the amount of pile drive and its rebound. 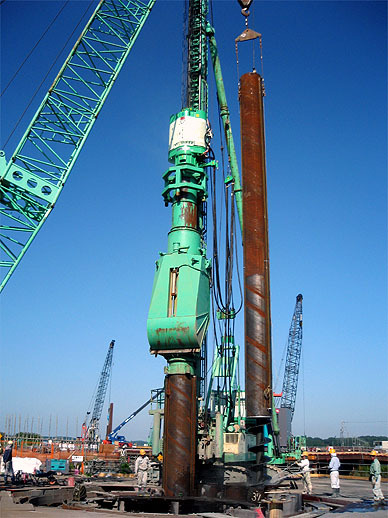 A method in which an auger screw is inserted into the hollow of a steel or steel wall pile, and rotated with an auger driver, then, the auger head installed on the auger screw point drills at the base of the pile and extract the soil via the hollow and bring out through the pile head. 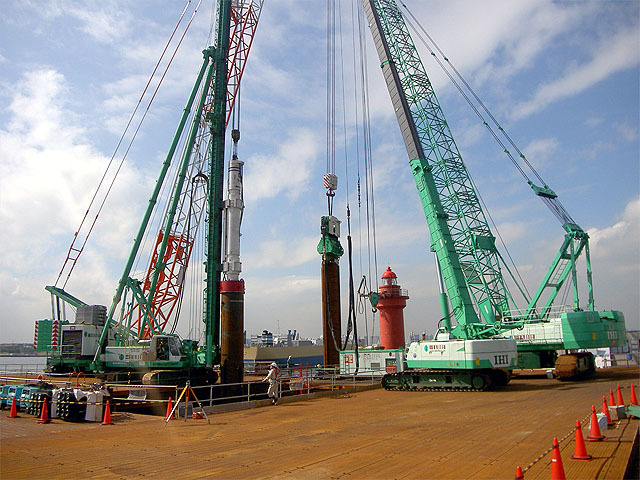 The pile is driven into the ground by its own weight or with a driver gear until it reaches the set depth. 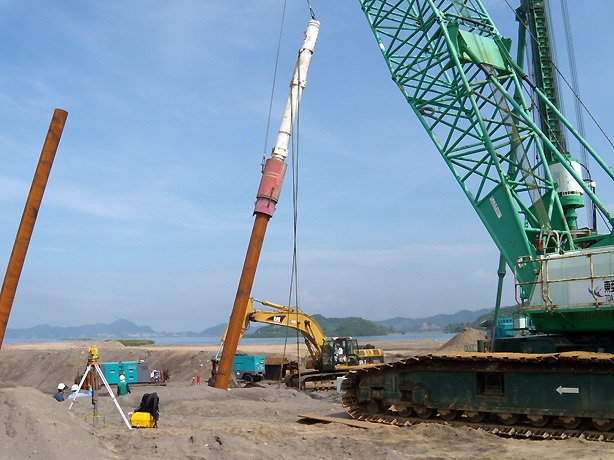 After reaching the depth, a hydraulic hammer strikes the pile head in order to drive the pile point into the bearing layer for optimal bearing capacity. 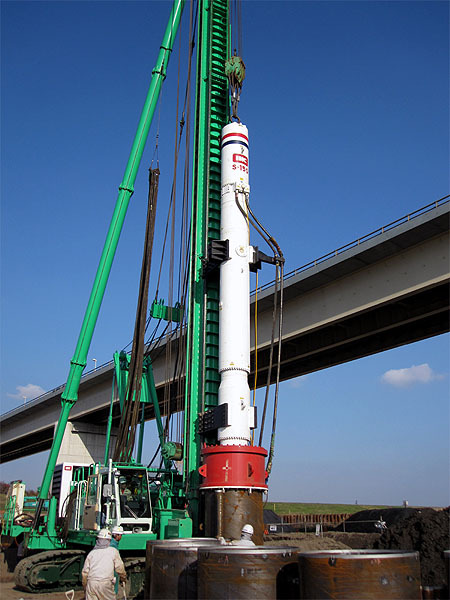 In the foundation consolidation method, a pile is driven into a set depth in the same manner as in the final strike method, and then using the special auger head and hollow of the auger screw to inject cement milk into the ground around the pile point to consolidate the foundation for optimal capacity.